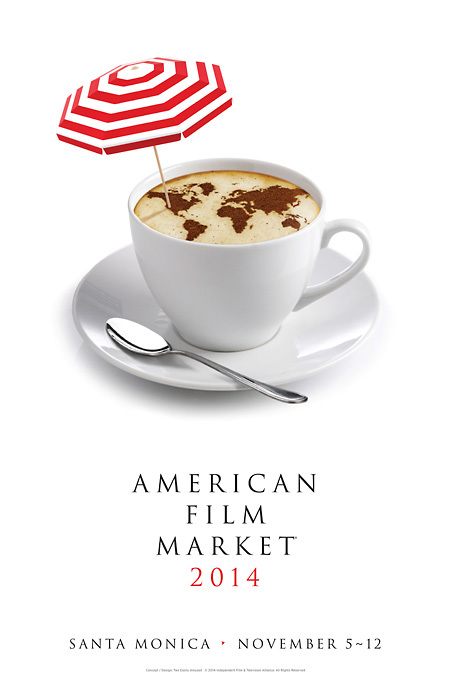 The annual American Film Market reminds us that professional filmmaking is a business venture, typically requiring a talent for recognizing what some people want and other people can offer. Breaking my first rule of being a positive person, just for a moment, I will warn those starting out in this business that they will find rejection instead of satisfaction, more often than not. But, you need to be positive by far if you want to persevere and succeed! After several ups and downs serving in public office, Abraham Lincoln was elected president of the United States. History doesn’t remember the elections he lost, even if the evidence is there. In your case or mine, fans will hopefully be watching our good movies 100, 500, or even 1,000 years from now, and not the bad ones. That’s right! Much like we enjoy the work of composers from several centuries past, the digital age will enable our movies to far outlast us. I think it’s kind of cool to imagine and, being that positive person, I’d also like to think people a century from now will give my under-watched movies the justice they deserve. I’m talking about feature films, of course, which seem to stand the test of time better than television shows or film shorts. Please don’t rush into making your next movie. Give yourself a good shot at it by making something original, unpredictable, well-acted, well-told, and sporting high production values. I am approached all the time by individuals with “the best movie idea ever.” I’ve always believed there are no bad creative ideas, so I listen and try not to judge hastily. I will then recap what they tell me. Finally, I ask if they are sure it would be worth 1,000 hours of each of their lives to make sure it gets made. As a writer/director myself, I have fleshed out creative ideas that I believe will someday make me successful. This sage advice is something I have to remind myself to take heed as well. What should be the next movie made, then, by me or any of you? To assist us with that answer, let me refer to experts I met with or heard speak at the most recent American Film Market (AFM). 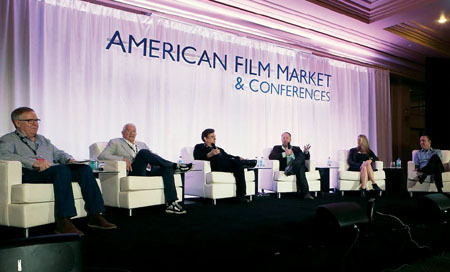 More than simply the pulse of the indie film industry, the AFM this past November brought thousands of knowledgeable persons to Santa Monica, California, to investigate what is and is not working in today’s media landscape. 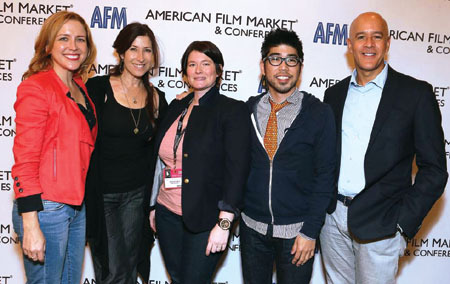 Several professionals shared their learned insight during the AFM’s Producer’s Forum. Sitting in for the first session, “Producing for a Worldwide Audience,” was Paul Hertzberg, CEO of CineTel Films (L.A. APOCALYPSE, FIRE TWISTER), who said that sci-fi/action disaster movies do well for his company. They make at least one per year and always find a market for them. Of course, Hertzberg has a formula to make this niche work. Science fiction necessitates quality CGI animation and the action scenes require a bigger budget than dramatic scenes. Because so many disaster movies have been made in the history of Hollywood, his (or your) next one has to be better than all those coming before it. If it is a remake, it has to be much better than the original. To finance a movie, producers used to locate 100 per cent of their money from one source. 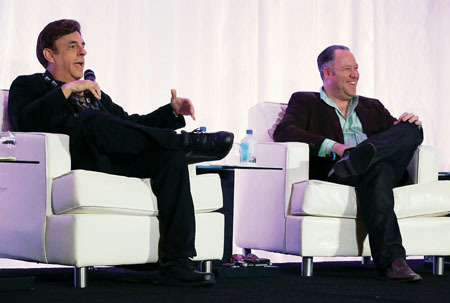 These days, producers such as the highly successful Mark Damon, CEO and chairman of Foresight Unlimited (LONE SURVIVOR, AND SO IT GOES), have switched to locating half of their budget from financing and the other half from tax credits and presales. I found it interesting that Damon suggested staying away from making period films unless based in the United Kingdom. DALLAS BUYERS CLUB and 12 YEARS A SLAVE seemed to find success, and more recently THE IMITATION GAME, SELMA, and THE THEORY OF EVERYTHING were popular. However, Damon is focused on success in terms of making money on your movie so you can make another. If you are first and foremost trying to change the world with your movie, it might be the only one you get made. Mimi Steinbauer, president and CEO of Radiant Films International (MADAME BOVARY, RUDDERLESS), is a sales agent for completed films. She handles six to eight dramas and comedies a year, targeting theatrical release. She suggested filmmakers work with her early in the process; with their input and a good budget, she can give a realistic estimate of its possible return. Like the other panelists, Steinbauer said that cast is key as well as having a topic everyone can relate to. Anything with a title or theme having to do with families (i.e., “mothers and sons”) says it all and travels well to other countries. The realistic situations and themes can cut through language barriers. At the same time, comedy can also travel but audiences in certain territories may have particular tastes (e.g., low-brow humor in Europe) or simply “not get” an American approach, like in Asia or Africa. Her company in particular doesn’t do presales as it could hurt everyone if the movie doesn’t perform. She said other sales agents do just that and, for them, it works. An example of a presale is where one approaches a sales agent or distributor, already having the equity portion of their budget in the bank and one or more stars attached. Then, the distributor calls on their overseas buyers and gets a check upfront to help make the film, based on how well the movie’s theme and lead actors have already performed in the buyers’ respective territories in the past. 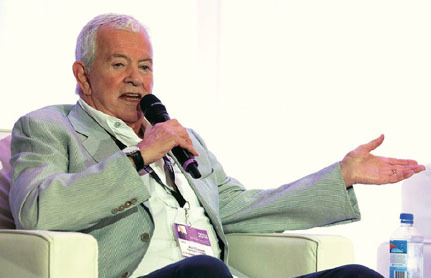 Mark Gill, CEO of Millennium Films (THE EXPENDABLES, DRIVE ANGRY), said that script is very key as his boss Avi Lerner is great at “smelling” the next trend. They are always focused on making $75-100 million at the box office per film and, even though a title like OLYMPUS HAS FALLEN did well, Gill likes to champion films with universal qualities. If international sales are not 80 per cent of their total income, Millennium won’t be interested. “Breaking even is a hobby, not a business,” continued Gill, who also noted he reads 5,000 scripts a year but only makes 12 movies in that same time frame. Major Studios. They have their own channels already in place, including specialty arms to promote a movie per its genre. Producers may achieve mass distribution but not see a lot of profit. Service Deal. Here, producers pay the distributor to promote the movie using money from its prints and advertising (P&A) budget. The advantage for this option is that earnings go directly to the producers and do not get lost in a studio’s accounting department. Do-it-Yourself. More and more, filmmakers decide to distribute their own movie, four-walling it in individual theaters or working a deal with a chain to get it in numerous theaters at once. This can sometimes gain traction if the movie is good and word spreads. While producers have total control of the percentage deal and get the money right away from ticket sales, they should be prepared to spend a year of their lives making the promotion happen. Not unlike Informant Media’s Brenner, entrepreneur Jerome Courshon is an advocate of focusing on the transactional side first and sees his own customers relying on non-theatrical avenues like Voodoo and iTunes to deliver their movies using VOD through cable, satellite, or Internet streaming. 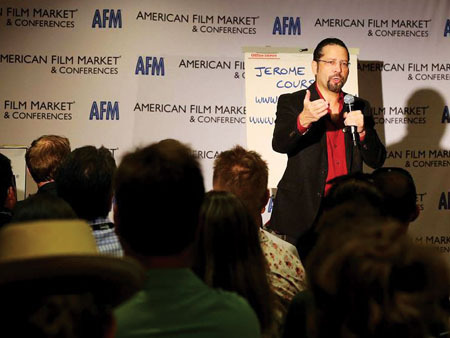 The first two options have 77.5% of the on-demand business with the latter a growing segment at 22% according to Courshon, who attended AFM to host his own presentation and promote his DVD product designed to help filmmakers better navigate the distribution process. A lot of us have been told DVD and Blu-ray are dead formats. However, while overall sales and rentals were down in 2014 they are still a multi-billion dollar market as well! To further my “Catch-22” analogy from before, Jessica Lacy of the talent agency ICM Partners said during the “Accessing and Procuring Talent” session that she puts projects together and then waits for film festival play to help sell them. Unlike Gill of Millennium Films, she only reads scripts that make The Black List or win an Academy Nicholl Fellowship; the exception is when someone brings her a project that has a well-known actor or director attached. Although she realizes attaching talent is difficult for beginning filmmakers, she confided that more actors are willing to take chances and work for lower rates these days. She suggested being very transparent to make sure the actor and their team know you are honest with your aims. For example, one shouldn’t fudge numbers when asked for them if the entire budget is not yet raised; try to offer perks to prospective talent such as allowing the actor’s own company to co-produce the film. United Talent Agency (UTA) partner-agent Rena Ronson underscored Lacy’s point about transparency. “Your word is your word,” she stated, “so if you ever want to deal with me or my company again, you need to come clean on what’s real.” Ronson has a (slightly ajar) open door policy whereby she meets with filmmakers once a month in case one may have an emerging star on their hands. She added that she learned this method from AFM because of the immense amount of potential talent running around the conference campus at the Loews Beach Hotel. Her firm has actors, directors, and producers as clients, so they are able to package the whole thing in house if need be, and recommends that filmmakers meet with younger “covering agents” who are looking for fresh opportunities for their clients. In summary, we all need to understand that Hollywood doesn’t really care if we make it. It is a multibillion dollar industry doing just fine without us. But, if we know we have the goods, starting with original stories and polished scripts, someone will discover us. Time will eventually provide the opportunities. Until then, we have to stay focused and better our craft. Robin Christian is an Illinois resident who travels between his offices in Champaign, IL, and Hollywood, CA. He is an award-winning independent filmmaker and can be reached at robin [at] dreamscape [dot] la. Article © 2015 Robin Christian. Used with permission. This entry was posted on Thursday, April 30th, 2015 at 12:00 pm	and is filed under Article du C-U, Business Matters, Gone Hollywood. You can follow any responses to this entry through the RSS 2.0 feed. Both comments and pings are currently closed.